This is a very special month indeed, with both Lunations in the mighty sign of Aries, the Warrior Archetype! The recent New Moon in Aries on April 5th heralded in new beginnings in terms of standing up for ourselves, becoming more independent and daring to take a risk. The Full Moon in Aries, happening on the 19th of April, has the potential to see that come into full bloom. This “Flower” Moon is also called the “Pink Moon”, meaning that it announces the blooming of early Spring Flowers. This Moon is also called the Egg Moon or the Fish Moon. Full Moons are all about culminations, letting go and releasing. Whatever may have begun at the New Moon can be “seen” now, as if bearing the fruits of our original intentions. New and Full Moons often have a lasting effect, up to six months, and so the things we release over this Lunation can be set to last. It’s very interesting that we have two Lunations in the sign of Aries, which is a rare event indeed, and is certainly a “call to action”. The opposite sign of Aries is Libra, and so the challenge comes in to balance our desire for independence, action and assertion with diplomacy and fairness. Relationships are a big theme, as Libra desires partnership and is a natural mediator, whilst Aries takes no prisoners and struggles to be diplomatic in your need for self led action. Mars is yet again in charge of this Aries Full Moon, and his partner, his paramour, Venus, who rules Libra, is a co-ruler. When they dance the dance of love, they can be inspiring, attractive and passionate. When they oppose each other, then there can be conflict and drama. This is not an easy Full Moon. The mighty Titans, saturn and Pluto, close together in the strict and unforgiving sign of Capricorn, cast a hard angle to this Full Moon, making us feel ready to explode – or implode. Together with a square to the Moon’s nodes, karmic counterpoints, this Full Moon can invite conflict with the ones we love. It can be a question of what “I” want, versus what “you” need, and we have to do our very best to tread gently, carefully, and develop keen negotiation skills, whilst facing our most tender wounds and trigger points. Relationships can improve now if we are conscious and aware of the intense energies at the moment. This is a potent Full Moon for the Warrior. 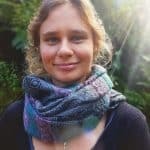 Your challenge is to learn to extend a peace offering to your lover, to understand the rewards of balancing your desires with theirs, and if necessary, to let go of a relationship that doesn’t allow you both autonomy balanced with intimacy. Taureans will feel this culmination in the area of your finances. It will be up to you to learn to share your resources with your partner, and try to let go of the need to cling onto your security – once you open up, you will learn the sheer joy of partnership, finding the balance between financial autonomy and healthy dependence. Gemini people will need to release the need to be “right”, and welcome in the lovely blend of both facts and philosophy – listening will become really important during the Full Moon in Aries for the Gemini. Integrating your ideas with another’s input will be extremely valuable and lead to growth. The sign of the crab will feel the push and pull in the area of your home versus career. Your desire may be to sit tight, safe in your shell, and your special Other may need you to support them professionally, whatever that may mean. Leo folks can look at balancing the desire for personal pleasure and instant gratification with the desire to be part of a team, part of a collective. The Full Moon in Aries 2019 offers the opportunity to really tap into the “group mind”, if you will allow, although you’ll have to watch for power struggles. The Virgos out there will learn to balance physical health with spiritual health. It is all very good and well to be eating right and having a healthy routine, but it’s quite another to have a true spiritual routine. Perhaps it’s your partner that can bring in that aspect of life. Whilst the Sun is in Aries, the Moon is in Libra, and Librans will strongly feel the desire to balance your tendency to “people please” with a desire to stand up for yourself, as scary as that may be. Relationships are a big theme for you, and you may either release a relationship that feels toxic, or release unhealthy patterns of relating. Scorpions will be asked to release your desire for ultimate power and to release drama from your lives, welcoming in peace, calm and stability – especially in the area of your finances. This is a time to let go of the desire for control. Sagittarians will be looking at releasing old beliefs that may be holding you back, and to bring in the polarity of fact to balance out your philosophies of life. It may also be a time in which keeping it local versus travelling far away comes into play. Capricorns will feel this Full Moon in Aries deeply. You will be asked to open up when it comes to all your relationships, whether family, professional and love, and the challenge is not to throw up walls. This time may being a culmination of professional matter, perhaps releasing a career or job that no longer is aligned with you. Aquarians will be asked to release friendships that are outworn or no longer fit your visions and ideals, and to bring in a more creative aspect into your goals, hopes and dreams. It may be time to release an old dream and bring in a new one. Pisceans go deep within at this Full Moon in Aries 2019, and will be faced with releasing self destructive habits when it comes to your relationships, to look at all the ways you can move from a space of being the victim to being empowered and strong in your relationships. 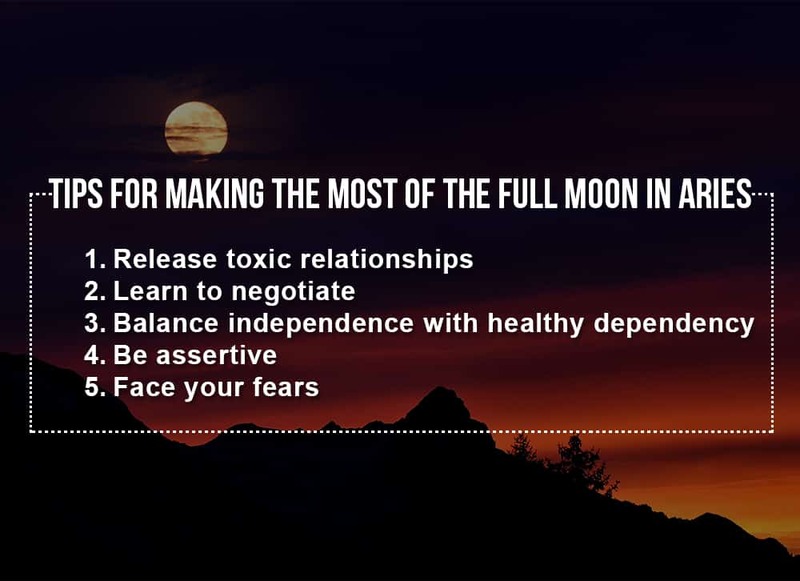 Release toxic relationships – Full Moons ask us to let go. If there is a relationship that just doesn’t serve you anymore, let it go, and let it go with Love. Learn to negotiate – Asserting your desires is important, but so is negotiating with the one you love. Everyone wins when you learn to listen to each other’s needs and strive to meet in the middle. Balance independence with healthy dependency – Relationships are a balance of personal freedom and togetherness. Find spaces to be yourself and do your thing, but make time for your partner, too. Allow each other space to grow. 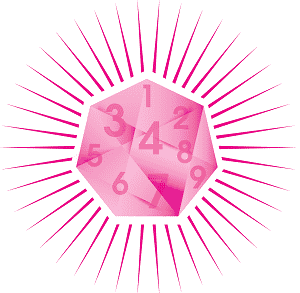 Be assertive – Aries asks us to stand up for ourselves. Release the need to please with backing yourself and your needs and desires. Also refer to Point 2 – negotiate! Face your fears – The challenging aspects to this Full Moon can place us square in the middle of some deep fears and triggers. Face them with courage, especially when it comes to your relationship wounds. This Full Moon in Aries 2019 brings our relationship issues to culmination, and may open up some deeper wounds that we may have forgotten or brushed aside – especially when it comes to balancing “us” and “them”. We may release an unbalanced relationship now, or learn to develop greater skills of diplomacy and cultivate growth and love with our partners. This Full Moon will feel intense for many of us, and we are challenged to dive deep. 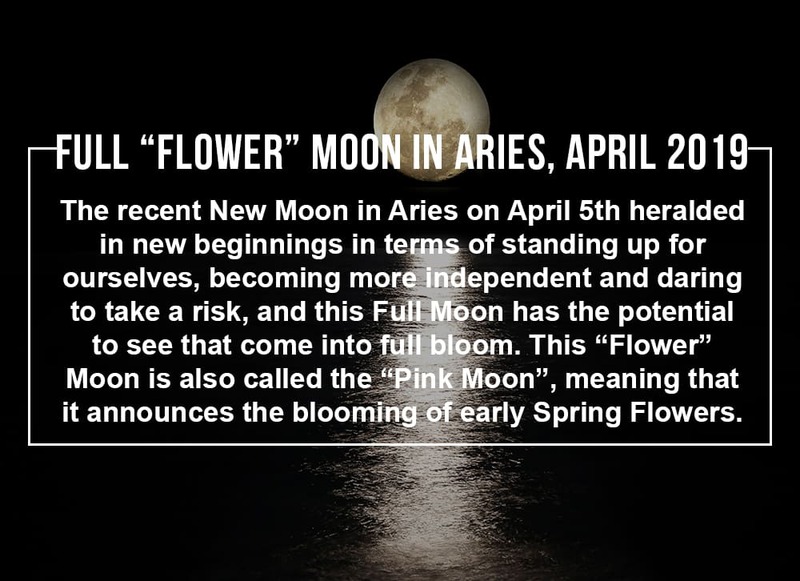 The Full “Flower” Moon in Aries happens 19 April 2019 and is also called the “Pink Moon”. 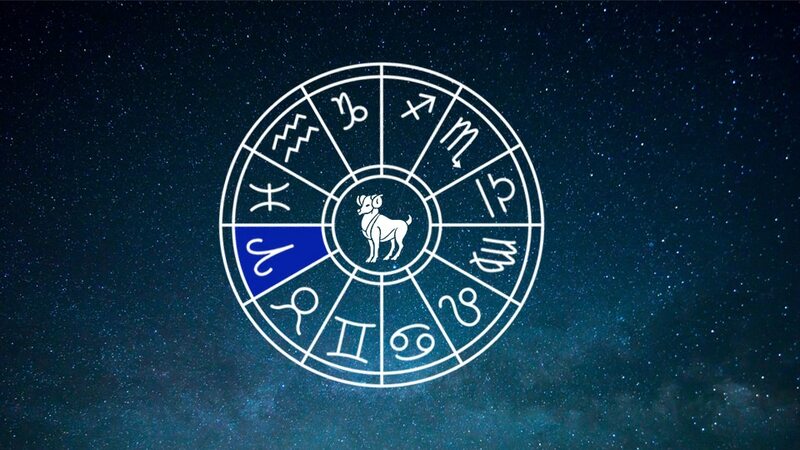 Find out how you can make the most of it for your zodiac sign.